EconoMe is a new decentralized model for digital content creation. Me Tokens, an ERC-20 token, acts as a community currency by Me-adopted social commerce platforms. Optimized for all users, Style.me is a shoppable, Instagram-like fashion experience. Style.me monetarily incentivises quality content creation from influencers and brands while rewarding users for opting in to receive targeted advertisements. The platform connects fashion influencers, consumers, and brands. For example, Influencers are able to post brands’ outfits on the platform. Shoppers like and share such posts. 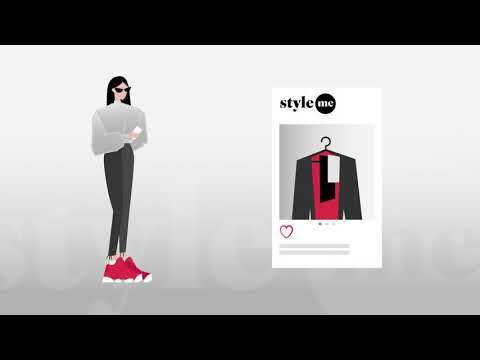 Using Style.me’s patented virtual fitting room, shoppers can try on the outfit, and even purchase directly. Fashion brands are happy due to a satisfied customer and a valued influencer. Our vision is to revolutionize the world of commerce by creating a global social commerce economy that meets the growing consumer demand for purchasing goods directly via social media channels. Additionally, we recognize the persuasive power of social media influencers, and we will empower both established and aspiring influencers to build and monetize their network fairly and efficiently via the Me Token economy. However, the different actors in the social commerce space are struggling to succeed. Traditional social media players such as Twitter, Instagram or Pinterest have been unsuccessful in integrating eCommerce into their DNA. Moreover, social commerce pure-plays have not been able to reach a satisfactory ratio of customer lifetime values versus customer acquisition costs. At the same time, influencers and aspiring influencers alike, who are the driving force behind the social commerce phenomenon, are largely unsatisfied with the platforms they frequent (e.g., Instagram) as the goals and policies of these platforms are not aligned with influencers’ financial and aspirational goals. With this in mind, we are building the Me Token, a cryptocurrency that will fuel the relationship between influencers, shoppers, and commerce platforms, allowing these key actors to be rewarded for engagement, content contributions, and any purchases that may result from these functions. More specifically, we are building a decentralized, blockchain-based ecosystem for digital content creation within a social commerce context which provides incentives for influencers, brands, and consumers. The Me Token’s inaugural platform will be Style.me, a fashion-focused social commerce platform that has been developed and will be launched prior to the token sale event. Style.me’s competitive advantage includes years of experience building a virtual fitting room technology for the fashion eCommerce space. We are now ready to move into our next developmental phase and integrate the use of the Ethereum blockchain along with the ERC-20 standardized token which will drive the Style.me social commerce market. This is a very commercial product, but the blockchain use case is not 100% clear. Good that there is a product and the team has a track record that may be able to deliver on this well. Styleme is a very good product. If you are blessed with partners and influencers you can expect a great demand. Team members are also excellent and experienced abundantly. ・There are already products, why is a $ 20m required? What does technology representing 50 to 60% represent? ・Is the SNS function added to the product? Or is it connected to a famous SNS? ・How do you earn a dedicated Ifrmencer? I hope this project will succeed. *I got a reply from the project and improved the score because I got a reasonable interpretation of the influencer which is an important element. Definitely am experienced team with some great advisors. Since I come from a digital marketing background, I like the idea of Style.me and feel that there is surely demand for it. More and more advertising dollars have moved to social platforms and it's only gonna increase further from here. If MeToken can execute well, they can certainly capture a good portion of the market. I think that it is a very unique project. There are already many block chain services already for influencers, but I think that this project is sufficiently differentiated. I think that it can be safe as a product because the application called style.me already exists. This will be part of future technology. Especially clothes had aspect that it was hard to buy on the Internet due to size and other problems. Style.me will be able to break through that problem. I think that many influencers will use this platform. Having experience with digital marketing, I personally think this concept is amazing. Cutting out the middleman in the online advertising world has proven to work over and over again. Connecting this to a blockchain token just makes sense! - Getting influencers onboard is going to make or break the project. How are you planning to do that? - Apart from influencers, how are you planning to reach critical user adoption for the app? All in all, very interesting project with a good vision and product. Not that much blockchain experience in the team, but that shouldnt be too big of an issue. thanks for your feedback. Let me talk a little bit about our strategy to grow the userbase. There are a few components to that. Let's talk about the Influencers first. In preparation to the project we have talked to 50-100 Content Creators. This helped us to identify two segments of content creators (with a total size of multiple million people) who will create content on another app if it is a) so effortless that they can do it next to working on their Instagram and b) rewards them with about a certain amount of dollar-equivalent cryptocurrency per day (if you want to learn more about what this amount is, pm us! We would like to not disclose the exact number publicly). We have created an experience that makes it very easy for content creators to start using our dApp next to their existing platforms and a Token Economy that will reward early adopters with an amount that will in many cases exceed their expectations. We know from other Social Commerce projects that the combination of these two factors can lead to great customer acquisition costs in these segments and we will test that out further with our Beta that comes out in September. Now, let's talk about User adoption apart from influencers. Firstly, the Token Economy is designed in such a way, that Influencers are highly incentivized to drive followers from their other Social Platforms to Style.me. The more engagement their fans create with their content, the more they will earn - especially in early stages of the project. Secondly, through our existing virtual fitting room business we will be able to tap into a user base of about 2 million user profiles that we can use to drive adoption. An interesting and promising project that meets the modern trends of the market, when advertising in social networks becomes more interesting and profitable than traditional advertising. Good team and good product! ⚠️On too many points promises are made and on the business model part lack of transparency and detail. - Country token emission ❌❌: You might have missed that in the Whitepaper: token emission will be in Cayman Islands. - Platform token sale available ❌❌: We are currently working on that and tokens will be available for purchase on metoken.net starting from July 23. - Strong Competitor analysis ➖Fair point. We believe that we have a good overview of the competitive landscape (both direct and indirect competitors, both on blockchain and off blockchain) but we don't really focus on that in the whitepaper. We will consider adding that in. - Events calendar ❌: Fair Point, we are about to add this to the website shortly. If you want to meet us, we will be at the Crypto Investors 5'o clock tea in London on July 24, and on the Priority Token Asia Tour 3rd Edition in Singapore (August 7), Kuala Lumpur (August 10), Ho Chi Minh City (August 13), Hong Kong (August 15) and Shenzhen (August 16). - show ROI to investors ❌We have valued the dApp very fairly with a $20m hard cap and 35% distribution making it an attractive opportunity. - have a powerful team and advisors ➖We believe that we have that base covered (obviously not saying anything else here) with a good mix of industry, venture building and blockchain background and track record. - meet investors F2F ➖We have done 4 investor related events and have five more planned in the coming weeks across Asia and Europe. These will be posted on our site this week. Additionally we are happy to have calls and meet one on one with potential investors. Once again thank you for the comments that can help to strengthen the project! 25% until 8th of October.